Tari needs to tell us again about his A+ Transparency Award. That was YEARS ago and he would never get another one because posting minutes is one of the requirements. The City must like FOIA requests. I wouldn’t have to file them if the person responsible for posting them did his/her job. 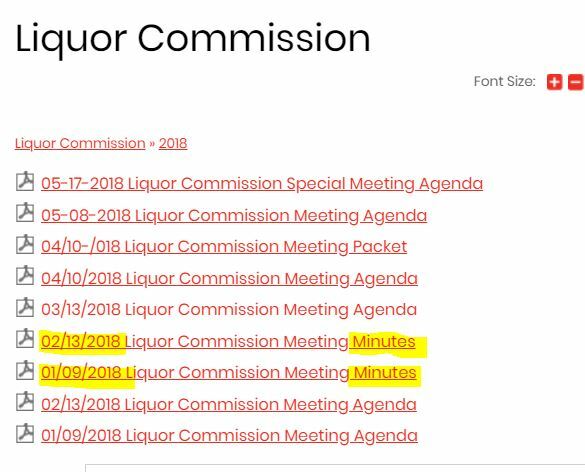 I’m not going to look at every Board and Commission listed, but the above proves a pattern of not caring about transparency. I wonder if the Illinois Policy Institute can revoke the award? Posted in BloNo, Bloomington, Local, Progressives, Rasmussen, Renner, Taxes.Tagged Illinois Policy Institute, Liquor Commission, MEETING MINUTES, transparency. Renner “accepted” the award on behalf of the City’s IT Department. It is not his award for transparency. I believe all of the “awards” that are received by the City are paid for through registration/application. Even the award for CT was “paid” for, not spontaneously awarded. IPI wasnt paid, it as legit, but it only meant 10 things they wanted on the website were present. Was there an application or did the IPI search Bloomington out to give the award? I keep thinking about Hales and his “financial management awards” that were paid for through membership dues. What IS the problem here? IT’s SIMPLE accounting. PERIOD! Now if a blogger can take the time to research the numbers, data, facts, etc, THEN I would imagine the city with it’s PAID EMPLOYEES WHO DRAW A PENSION could at least do their damn job and post the data on a TIMELY manner! SIMPLE, huh? Makes me wonder IF they balance their OWN checkbook?? I think your preaching to the chorus. Suppose,the very same employees that you are demanding from, were instructed to do as they are told by people responsible for signing the checks? If your job is on the line?